SPCookieQueen: Tomato and Basil Soup with Panini Soldiers and it's my birthday! Tomato and Basil Soup with Panini Soldiers and it's my birthday! Yes all the rumors I've been circulating on social media are true; it is indeed my birthday! (Please hold your applause, it's a yearly thing.) Honestly I don't find the day all that exciting. Usually I just give myself a high five because I did wake up after all. Last week when I ordered a glass of wine at a restaurant the server asked if I was 21, after I quit laughing at her I informed the nice young lady I was going to be 45 in a week. "Oh," she replied. "My mom died at 44." I immediately offered her my condolences and when she came back with my glass she added, "Make sure and take good care of yourself." I wasn't quite sure if she was trying to tell me I was looking as tired and run down as I felt or if she was psychic and knew something I didn't. Usually I look forward to making myself an over the top dessert involving multiple layers and flavors but Mr. Bubonic was hanging out on the couch today ill and feverish and I figured it was much safer to hide upstairs in my office and catch up on some work. Fine I will eat healthy even if it kills me I kept uttering to myself. The heirloom tomatoes I've been buying are so dripping fantastic right now I decided if I have to preserve my life longer I was going to do it with a bowl of Tomato Basil Soup. Don't ask me how this sounded good, considering I have went to bed with the smell of tomatoes oozing from my pores the last few nights while I rebuild my inventory for the year. Cut tomatoes in half and remove cores, place the halves cut side down on a baking sheet lined with parchment and place in the oven for 10 minutes. Let cool 10 minutes. Peel the skins off the tomatoes and squeeze the seeds out into a sieve over a bowl. Reserve all the tomato juice and pulp. In a stockpot add the olive oil, carrots, onion, and bell pepper and cook on medium-low heat till veggies are starting to wilt and become translucent. Add the tomatoes and juice, salt and pepper, and simmer on medium heat for 15 minutes. Add the basil and cook 5 more minutes. Use an immersion blender and pulse until semi-smooth. If you want a chunkier soup you can skip this step. Slather a little pesto on a piece of sourdough, a couple nice slabs of mozzarella, top with another slice of sourdough, place into a Panini maker or pan, drizzle the top with olive oil. Wait for the crustification and oozification to take place and slice into soldiers. I bought the bread, pesto, and cheese; after all I probably don't have much time to waste after my ominous warning. But if you have plenty of more years ahead of you here are a couple of recipes you may want to try. As for the source of the Black Death outbreak, well I traced it back to an unlikely source. After much research and tapping my vast medical knowledge I had no choice but to conclude that Rusty is the pariah. I have no idea how I could have missed it, it was right there staring at me the whole time: Blackening nails and an inguinal bubo on his armpit region. If I make it to 45 years and 1 day all bets are off and I'm going back to decadent baked goods. In the words of my wise daughter, "YOLO!" more candles to blow, and of course, more birthdays to come. I hope that you spend the day eating decadent desserts, as well as tomato soup, and spend the day with your loving family and friends. I have no doubt that you will be around for my more birthdays. Every time I read your blog, i come away feeling that "You are the sunshine in my life," and I'm always laughing so hard. You have an innate gift of making people laugh and smile, and that is a great gift. I am so blessed to have you as a friend, not to mention all of your wonderful jam. Happy Birthday Gina! Would love a bowl of your soup for lunch today...hmmmmm...how am I going to make that happen ...do you deliver to Bend, Oregon? Happy birthday, Gina! Wish I could bake you a special treat :). 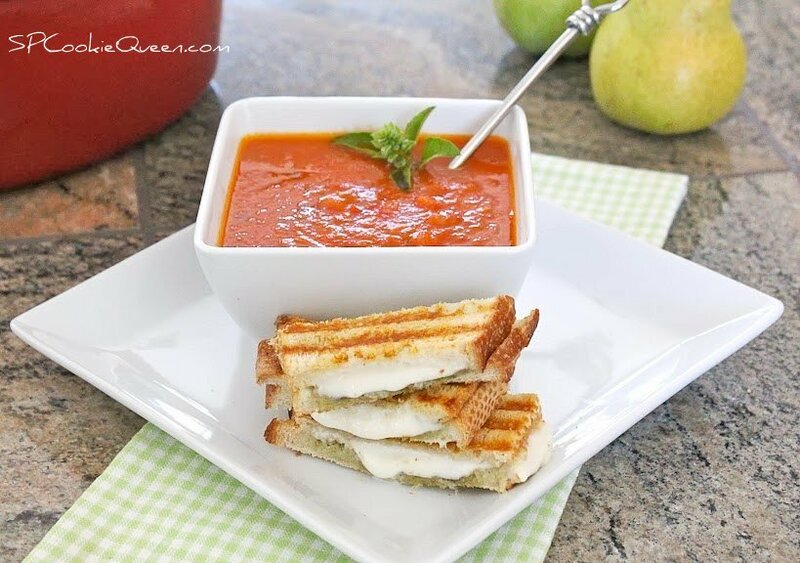 Love tomato & basil soup, and panini soldiers are the perfect side! Thanks everyone, it's been a great day so far and all of you have made it that much better. Both soup and panini look very delicious. Love your awesome tomato soup, and the yummy little mozzarella Panini sandwiches. That's exactly what my grown adult son asked for me to make for him and my little granddaughters for dinner last week. (but just simple grilled cheese)...love the creative little 'soldiers'...thanks for sharing! Big Hugs to you my dear friend! Thank you Elisabeth. I know a cake from you would have been grand I'm sure. Thanks for the hugs. Happy Birthday! And to celebrate you made us this terrific soup. ;-) Lovely stuff - thanks so much. Glad you made it Queen! And put another jewel in that crown for good measure! 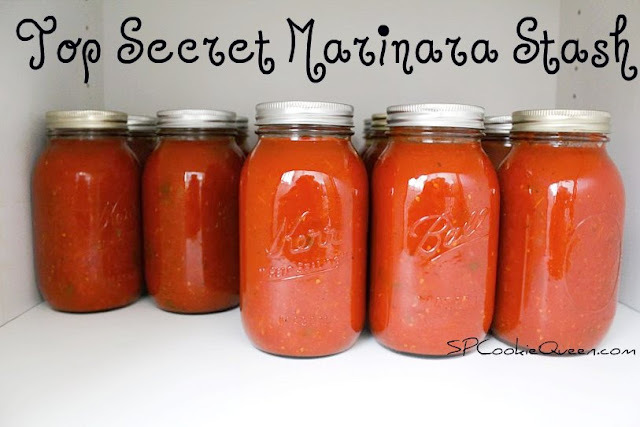 Your marinara looks to die for...no pun intended ;) and why do you have to make me so hungry all the time?! Tomato Basil soup is by far my favorite and the soldiers make me stand at attention!